The best frankincense in the world, since ancient times, comes from the south of Oman, bordering Yemen. Here was the starting point for the famous Frankincense Trail. This very fine frankincense from the Dhofar Mountains, with its high content of essential oils, exudes an intense, typical balsamic fragrance. This top-quality "Al Hojari" frankincense also has various grades, based on the color. Therefore this darker-colored frankincense can be offered to you at a reduced price. This frankincense is most suitable for burning on coals, and has the typical smell of Omani frankincense, with some extraneous elements. Frankincense is also used for consecration, blessing, purification and protection. The fragrance is sweetish-heavy and creates an atmosphere of clarity, purity and tranquility. It is both stimulating and relaxing. In Oman it is used to infuse a nice aroma into clothing, and also has a disinfecting quality. The fumes eliminate negative energies in the space between people. The smoke also repels insects and is effective when used outside on the terrace in the evening. Anyone who is familiar with frankincense from other parts of the world will appreciate this offer in terms of its quality and price. The frankincense is packed in a resealable PE bag. The frankincense we offer is intended to be used only for burning over charcoal, as per historical use and traditions of the Omanis. 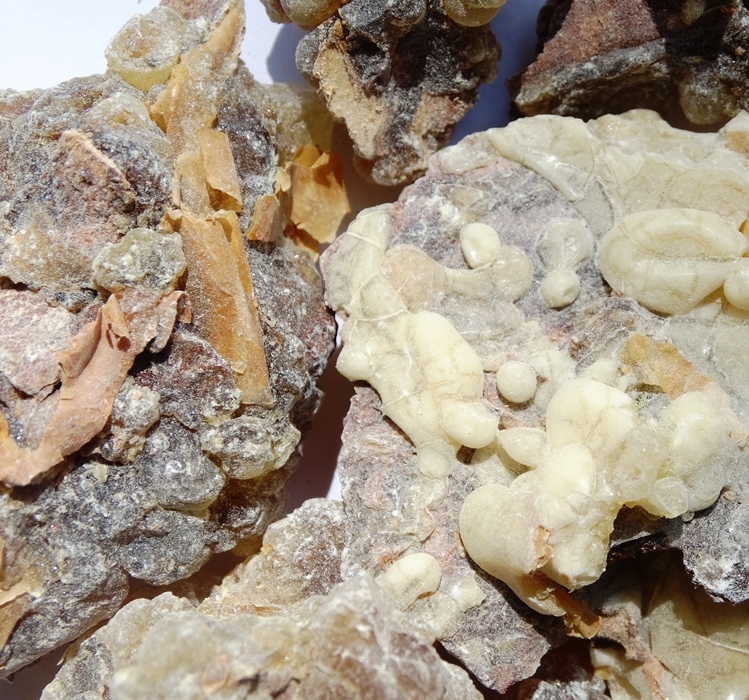 It is expressly pointed out that other information pertaining to the article description regarding the effects of frankincense are not scientifically proven. This information does not supercede a doctor's advice. The buyer is responsible for the correct application and usage. greenish/grayish white, best quality Origin of the Sultanate of Oman, Dhofar 30gr. in bag, sorted into 4 -12 mm pieces Direct import! Often used for the creation of fragrance and incense mixtures. 5 packs with 8 incense sticks each, made from pure frankincense Made in Oman, with Omani frankincense.